Hazelnut syrup could be used in many recipes – desserts, cremes, mousses, drinks and even sauces for savory recipes. 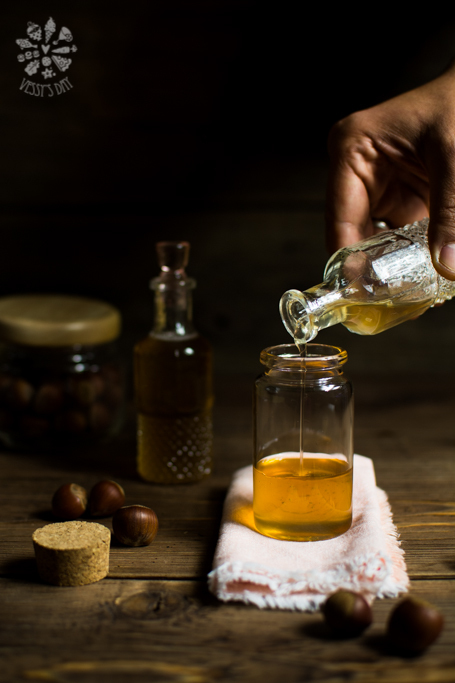 If you can’t find hazelnut syrup in your store, you could easily prepare one yourself at home – it is easy and you don’t need anything but water, sugar and hazelnuts. Place the hazelnuts in the baking sheet and bake in a preheated oven to 180 C (350F) for 15 minutes. Once they start to brown, remove from the oven and peel. Chop the nuts roughly and set aside. In a large saucepan heat the water and sugar. Stir on medium high until the sugar dissolves. Once the sugar dissolves turn down the temperature to medium-low and add the hazelnuts. Cook for about 45 minutes as you stir occasionally – by that time the syrup will be a bit thicker, but it will thickens additionally once it cools off. Basically the more you cook the syrup the stronger hazelnut flavor you will get and the thicker it will becomes. Strain the syrup into a jar and let it cool completely before you close the jar. This syrup could be kept in a dark, dry place for about a month. Syrup could be used in many sweet recipes or for flavoring drinks. Hi! I tried your recipe and the water just evaporated in my pan and only the crushed hazelnuts were left. What did I do wrong? Hi Stella! I am so sorry to hear that. I believe the temperature was too high and the water evaporated quickly, which had left you with just hazelnuts and sugar. If you want to give this recipe another chance, just add a few extra tablespoons of water and cook syrup to the lowest temperature setting of your stove, just simmer it gentle for 20-30 minutes. If you see you have enough liquid left you can continue to simmer it for total of 45 – 60 minutes. I would love to hear if it turns out ok next time. Did you use the discarded hazlenuts for anything? Is there anything you *could* use them for? Hi Cat! Yes, I did a quick chocolate fudge topped with the candied hazelnuts. I haven’t posted the recipe on the blog, yet, but if you want it, just email me at veselina.zheleva@gmail.com and I will email it back to you. Basically, you can add them to all kinds of baked loafs and muffins. great idea! I’m thinking pancake and waffle topper – have you tried it? Andie, I haven’t tried it, but but this is a great idea! If the hazelnut syrup is cooked a bit longer to get thicker, it will be a great substitute to maple syrup (for instance). i will try this sometimes!